Really, what can't vinegar do? Over the last several years, I have written a lot of posts about making your own health, beauty, and cleaning products. And if I had to guess which one item comes up most frequently in these types of posts, I would definitely say that it’s VINEGAR! Inexpensive, unassuming vinegar has cleaning, deodorizing, and softening capabilities that have made it an indispensable part of my around-the-house arsenal. To highlight just how useful it is, and just how much I use it personally, I’ve decided to put together a list of some of my favorite uses for vinegar to share with all of you. The best thing about this homemade stain stick is that you don’t need to wash the stained item right away! Rub the stain stick onto a fresh stain, toss the item in your hamper, and wash it the next time you do laundry. The stain will lift right out! This non-aerosol dusting spray uses vinegar and natural oils to clean, shine, and protect your furniture. And the addition of lemon essential oil makes your home smell fresh and clean, too! There’s no doubt about the convenience of laundry detergent tabs and pods, but they can be really expensive! Homemade laundry detergent is incredibly affordable to make, and there’s no need to sacrifice convenience – you can easily make your own single-use laundry detergent tabs right at home. Listerine and vinegar in a foot soak? It may sound crazy, but don’t knock it until you’ve tried it! It’s easy, affordable, and I loved how soft my feet felt afterwards! Making your own cleaning rags that are ready when you need them and can be used over and over again is just a great idea. They save time and energy… and after you try them you will wonder how you lived without them. Reduce pore size, tighten skin, clear up your complexion and give your skin an overall healthy and rejuvenated appearance with this mask using some of my favorite natural ingredients for skin issues. Yoga mats get covered with sweat and breed bacteria and the best way to clean them is spraying them down after each use. Try this super simple recipe for an all-natural mat spray that is inexpensive, easy to make and will keep your mat safe and clean. This wrinkle-release spray is perfect for when your clothes need some reviving when traveling, or when you just don’t want to drag the iron and ironing board out. This stain remover technique is a miracle worker in my eyes! I originally tried it on a stain my grandpuppy Milo so lovingly left in my living room. I had scrubbed and scrubbed that stain with other cleaners to no avail, but this technique got it right out! When it comes to stinky shoes, you need to go right to the source of the problem, the stinky feet! A vinegar soak a few times a week will do the trick to keep feet smelling clean and fresh. This homemade version of the popular “Soft Scrub” cleaner works every bit as well as the real thing. Use it to clean sinks, counters, tubs, showers, and more! Mildew buildup on your bath towels can make them smell funky, rather than fresh. But there’s an easy fix! With the help of some baking soda and vinegar, they will come out of the wash feeling fluffy and smelling great. This “detox” bath is perfect for unwinding after a hard day, or if you’re feeling under the weather. Epsom salt, apple cider vinegar, and bentonite clay will help you relax, restore, and get a great night’s sleep. A broken down garbage disposal can lead to all kinds of expensive plumbing and drain problems. Here is a quick, easy, and cheap idea for keeping your kitchen smelling fresh and your sink drain working properly. Apple cider vinegar can be used for so many things including homemade beauty products and all sorts of natural remedies. Making your own is easy and costs pennies if you use your own apple scraps! Suede is such a great material, but many people avoid it because it gets dirty quite easily and they are afraid of cleaning it! Well fear no more! You can return your scuffed, stained and dirty suede shoes to their previous glory and keep them that way just by following this simple cleaning procedure. I love using vinegar for cleaning! It’s non-toxic, inexpensive, easy to find, and cleans just about everything! This lemon-scented version also makes your house smell great! Traditional store-bought weed killers contain some seriously toxic ingredients! But good ol’ white vinegar works just as well at getting rid of pesky weeds around your yard and garden. This 2-ingredient shower cleaner will cut through soap scum like nothing else I’ve ever used! And I’m willing to bet you have the ingredients sitting in your cabinet right now. If you’ve ever ended up with blue hands, or stained car or couch upholstery from dark denim jeans, then this post is for you! With just a few simple steps, you can set the color in your jeans and keep them looking like new for years to come. This homemade fabric softener recipe is definitely the easiest that I’ve come across. All you need to do is combine three simple ingredients that you probably already have! Plus, it smells amazing! If you have oily skin, you have to try these cleansing pads! You can put them together in minutes, and you have the perfect wipe for oily skin. The vinegar leaves your skin clean and soft while killing acne-causing bacteria. Why have just one fabric softener when you can have five? ;-) Here are my top 5 favorite methods and recipes for natural fabric softeners, including homemade dryer balls, reusable dryer sheets, and more! If you make a lot of homemade and natural cleaning products, you may already have all of the ingredients to make this homemade dishwasher detergent! It’s easy, cost-effective, and can also be used as a scouring powder. This toilet bowl cleaner is easy to make and even easier to use! Leave it in your toilet bowl overnight, give it a quick scrub in the morning, and your toilet will really sparkle. This homemade floor cleaner uses vinegar to clean and deodorize, and the addition of castile soap gives it some extra muscle to power through sticky messes. And a little bit goes a long way! These two window-and-glass cleaners make a great duo for tough jobs. Vinegar helps dissolve stubborn hard water deposits, while the second cleaning mixture will dry quickly for a clean, streak-free shine! Say goodbye to smeary fingerprints and dog drool splatters on your computer screen! (My grandpuppy Milo has a tendency to cover everything in drool, that stinker!) Your electronics will shine after a quick cleaning with this simple homemade spray. Dusting furniture is always such a chore – until now! These lemon dust cloths are easy to make, they’re great for your furniture and they smell so nice. I love poached eggs! But cooking them can be very difficult. It turns out that vinegar is your secret weapon for cooking perfectly poached eggs. You’ll be amazed at how simple it can be! I used to hate cleaning my microwave, because the crusted-on messes were impossible to wipe away. But using this method, this chore is now a breeze and leaves my microwave looking brand new. Vinegar is one of my most trusted and effective ingredients in my homemade cleaning products. Discover the added power of heating vinegar to loosen stuck on food with this chemical-free refrigerator cleaner. As your mops and sponges are cleaning, they are also harboring and even spreading germs. Here is help for keeping your cleaning tools clean & hygienic! These homemade dishwasher detergent tabs are not only extremely convenient to use, they’ll cut through your toughest caked on food messes with ease! I go through a TON of washer fluid in the winter months! And while it’s not terribly expensive stuff, the cost definitely adds up over time. This homemade version costs next to nothing and cuts through grime just as well as the store-bought stuff. Reusable shopping bags are a serious breeding ground for all kinds of nasty bacteria! And they’re one of those items that most people don’t think to clean. Luckily, vinegar comes to the rescue once again to save your bags from contamination. 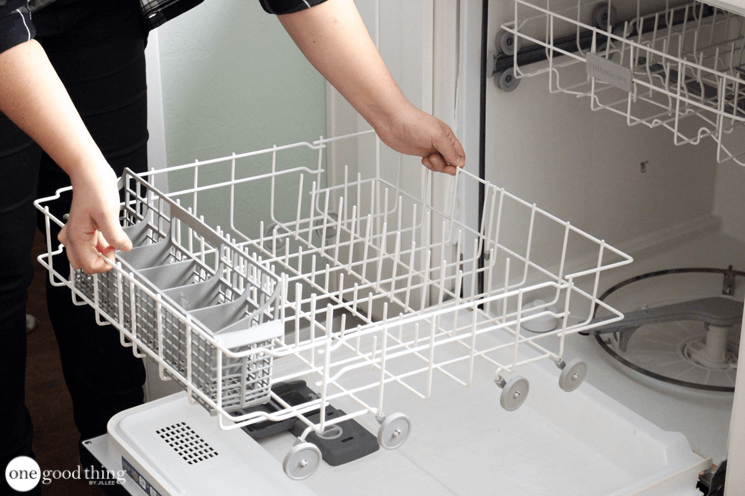 Cleaning your dishwasher? Is that even necessary? I assure you it is! It’s a simple process that will leave your dishes cleaner than ever. Believe it or not, your washing machine needs a regular cleaning. Load after load, your machine starts to collect quite a bit of grime. This method will leave you with a sparkling washing machine that smells great! After an illness, it’s important to clean light switches, remotes and more. This antibacterial spray is the perfect thing for killing germs and refreshing a dirty home. This is the ultimate stain remover for grass stains. Simply combine a few ingredients, spray the stain, and wash the garment. The grass stains will disappear! This simple homemade toner balances the pH of your skin while killing bacterial and clearing out your pores. It brightens your complexion, fights acne, and leaves your skin felling so soft! A clogged sink drain can be a real hassle! But with baking soda and vinegar, you can unclog your sink naturally and easily. Avoid calling a plumber and try this DIY instead! I love my humidifier, but it starts to collect some “gunk” after a while. Luckily, a bit of vinegar will cut through the mineral deposits and get your humidifier running smoothing again! Apple cider vinegar has many health benefits, and drinking a small amount every day can really help boost your overall immunity. Add a drop of Defend essential oil blend for an added boost! The all-natural secret to super soft and shiny hair? Vinegar! Some people even use it to replace their conditioner entirely. Growing up in Southern California, I used to spend my summers at the pool. I was no stranger to Swimmer’s Ear, which would sometimes turn into painful ear infections! I wish I had known about these pediatrician-recommended homemade ear drops back then! Kitchen floors can become as slippery as ice rinks when they are subjected to oily splatters. This homemade cleaning solution will help cut through the grease, and save you and your family from slipping and falling! Treat your tired feet to a spa-like experience in the comfort of your own home with this simple foot rub made from natural ingredients! What’s your favorite way to use vinegar? your “love” you put in your blogs. Love from Canada…. I bought a gallon of white vinegar, added about 30 drops of essential oil. I shake it before I pour it in my fabric softener dispenser. No more smelly towels. Thanks for sharing. I keep straight white vinegar in a spray bottle by the sink for an easy fruit/veggie wash, disinfecting the sink, handles, faucet, counters and stove top. Also great on slime in dog bowls or anything else that doesn’t rinse out easily before washing. Great ideas I knew and more I didn’t. Thank you. I hope it never happens to you but if you ever get burnt in the kitchen, spill some vinegar on the affected area. You would think that it will worsen the situation. But not only does it immediately soothe the pain, it also accelerates the healing process. You will be surprised at not having any pain or blisters at all! I really enjoyed. Your article about 50 amazing things you can do with vinegaro Where can I find the exact ingredients and the amount to use? This article doesn’t specify. Also whe I am on your website I almost always get a notification about your site not being safe or whatever it says, and I always press on continue. I look forward to receiving your reply. Thank you, Diane E. . I can’t stand the smell of white vinegar. I had to lock myself in my room every time my mom cleaned the kitchen with it. I am going to try to make the scented version. Can I use that in all of the uses you mention that calls for white vinegar? I just did my bathtub with the mixture of vinegar and dish washing soap. Everything is sparkly clean with no scrubbing! I love using household ingredients and not spending a fortune on “specialty” cleaners.